As I do during this week every year, I am taking some time off to relax and prepare for the new year. Every day this week I will be featuring the most popular blog posts of the year. This one of the most popular posts in May. A couple of weeks ago Google released the new web-based version of Google Earth (take a tour of it here). The older desktop version of Google Earth is still available for free as well. The advantage of the web-based version is that anyone with a Chromebook or laptop can use it. The disadvantage to it is that it doesn't have as many features as the desktop version. Both versions have a place in the classroom. 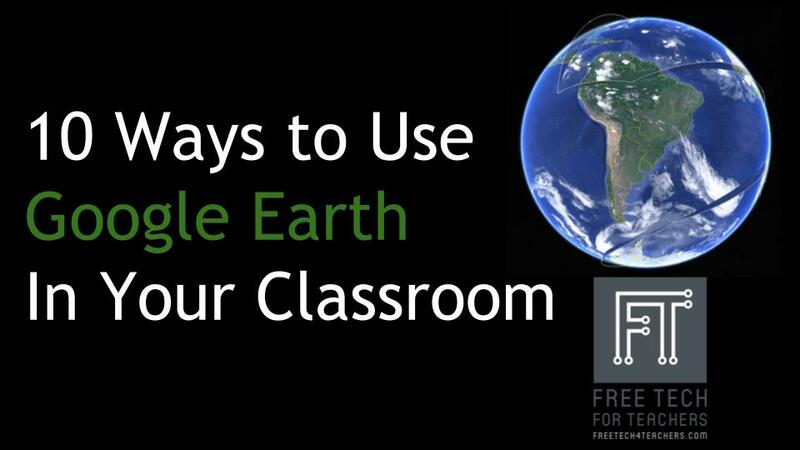 Here are ten ways you might have your students use Google Earth in your classroom. 1. Take a tour of new and interesting places. This is the most basic activity that you can do either version of Google Earth. The new version has many pre-made tours called "Voyages" that your students can view. Stops on the voyages include notes about the notable landmarks in the tour. The desktop version of Google Earth also has some pre-made tours. You can also find tours made by others and use them in Google Earth. Watch this video to learn how to do that. Create a scavenger hunt for students to complete by using clues and finding the answers "hidden" throughout the globe. This can be a fun way for students to test their knowledge of physical and human geography. The desktop version of Google Earth has built-in tools for creating tours of landmarks around the world (watch this video to learn how). The web version of Google Earth doesn't have the same tour recording tools, but you can use this option for creating placemarks and this option for creating a tour. Over the years I've had students create Google Earth tours of Civil War battle sites, the significant places in a person's life, and places that they want to visit some day. Google Lit Trips is dedicated to helping teachers use Google Earth tours in literature lessons. Use this method for creating placemarks in the new Google Earth and you can show multiple data sets in one map. 5. Layer images over maps. The desktop version of Google Earth lets you layer images over a view of the world. Adjust your zoom level to cover more or less of the map with your image. Adjust the image's opacity to let the map faintly show through the image. This is a great way to show students a comparison of a historical map with a contemporary map. Try using this method to show how coastlines and waterways have changed over time. The desktop version of Google Earth includes a measurement tool. The desktop version of Google Earth includes a moon view. Select the moon view and view some of the placemarks in the NASA layer. You can explore Mars and through the use of the NASA layer in the desktop version of Google Earth. 9. Watch a timelapse of imagery. The desktop version of Google Earth has a timeline slider that you can use to see historical imagery of some cities. 10. Use Google Earth as an alternative to PowerPoint. The next time you're thinking about having students give a presentation on a place that they've studied in your geography lesson, have them create a Google Earth tour instead. They can use their custom placemarks shown in full size as an alternative to using slides. Learn more about Google Earth in Teaching History With Technology.